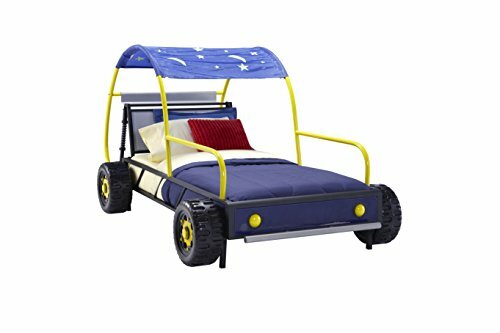 Get your child ready to drive off into dreamland on the Dune Buggy Car Twin Bed. This fun twin size bed is the perfect centerpiece to your race car loving child's bedroom. The metal shaped bed is reminiscent of a dune buggy and features realistic wheels, headlights and bumpers. A star and moon canopy hangs over a portion of the car. The blue, silver, black and yellow finish is the perfect color scheme for a little boy's room. Fits a standard twin size mattress, sold separately. Some Assembly Required. Manufacturer: L. Powell Acquisition Corp. Publisher: L. Powell Acquisition Corp. Studio: L. Powell Acquisition Corp.